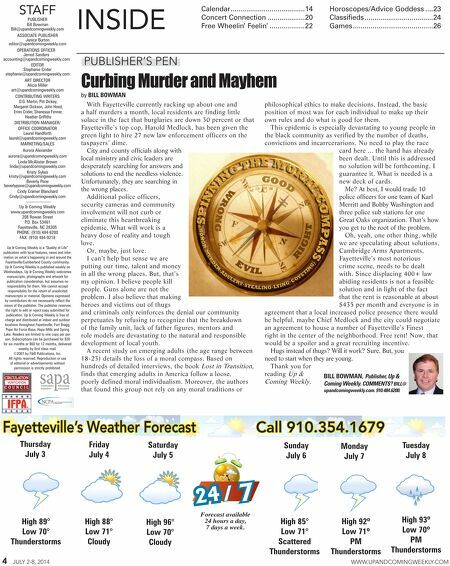 4 JULY 2-8, 2014 WWW.UPANDCOMINGWEEKLY.COM High 93º Low 70º PM Thunderstorms With Fayetteville currently racking up about one and a half murders a month, local residents are finding little solace in the fact that burglaries are down 30 percent or that Fayetteville's top cop, Harold Medlock, has been given the green light to hire 27 new law enforcement officers on the taxpayers' dime. City and county officials along with local ministry and civic leaders are desperately searching for answers and solutions to end the needless violence. Unfortunately, they are searching in the wrong places. Additional police officers, security cameras and community involvement will not curb or eliminate this heartbreaking epidemic. What will work is a heavy dose of reality and tough love. Or, maybe, just love. I can't help but sense we are putting our time, talent and money in all the wrong places. But, that's my opinion. I believe people kill people. Guns alone are not the problem. I also believe that making heroes and victims out of thugs and criminals only reinforces the denial our community perpetuates by refusing to recognize that the breakdown of the family unit, lack of father figures, mentors and role models are devastating to the natural and responsible development of local youth. A recent study on emerging adults (the age range between 18-23) details the loss of a moral compass. Based on hundreds of detailed interviews, the book Lost in Transition, finds that emerging adults in America follow a loose, poorly defined moral individualism. Moreover, the authors that found this group not rely on any moral traditions or philosophical ethics to make decisions. Instead, the basic position of most was for each individual to make up their own rules and do what is good for them. This epidemic is especially devastating to young people in the black community as verified by the number of deaths, convictions and incarrcerarions. No need to play the race card here ... the hand has already been dealt. Until this is addressed no solution will be forthcoming. I guarantee it. What is needed is a new deck of cards. Me? At best, I would trade 10 police officers for one team of Karl Merritt and Bobby Washington and three police sub stations for one Great Oaks organization. That's how you get to the root of the problem. Oh, yeah, one other thing, while we are speculating about solutions, Cambridge Arms Apartments, Fayetteville's most notorious crime scene, needs to be dealt with. Since displacing 400+ law abiding residents is not a feasible solution and in light of the fact that the rent is reasonable at about $435 per month and everyone is in agreement that a local increased police presence there would be helpful, maybe Chief Medlock and the city could negotiate an agreement to house a number of Fayetteville's Finest right in the center of the neighborhood. Free rent! Now, that would be a spoiler and a great recruiting incentive. Hugs instead of thugs? Will it work? Sure. But, you need to start when they are young. Thank you for reading Up & Coming Weekly. Curbing Murder and Mayhem by BILL BOWMAN STAFF Calendar.......................................14 Concert.Connection....................20 Free.Wheelin'.Feelin'...................22 Horoscopes/Advice.Goddess.....23. Classifieds....................................24 Games..........................................26 INSIDE PUBLISHER'S PEN PUBLISHER Bill Bowman Bill@upandcomingweekly.com ASSOCIATE PUBLISHER Janice Burton editor@upandcomingweekly.com OPERATIONS OFFICER Jerred Sanders accounting@upandcomingweekly.com EDITOR Stephanie Crider stephanie@upandcomingweekly.com ART DIRECTOR Alicia Miller art@upandcomingweekly.com CONTRIBUTING WRITERS D.G. Martin, Pitt Dickey, Margaret Dickson, John Hood, Erinn Crider, Shanessa Fenner, Heather Griffiths DISTRIBUTION MANAGER/ OFFICE COORDINATOR Laurel Handforth laurel@upandcomingweekly.com MARKETING/SALES Aurora Alexander aurora@upandcomingweekly.com Linda McAlister Brown linda@upandcomingweekly.com Kristy Sykes kristy@upandcomingweekly.com Beverly Pone beverlypone@upandcomingweekly.com Cindy Cramer Blanchard Cindy@upandcomingweekly.com ––––––––––– Up & Coming Weekly www.upandcomingweekly.com 208 Rowan Street P.O. Box 53461 Fayetteville, NC 28305 PHONE: (910) 484-6200 FAX: (910) 484-9218 Up & Coming Weekly is a "Quality of Life" publication with local features, news and infor- mation on what's happening in and around the Fayetteville/Cumberland County community. Up & Coming Weekly is published weekly on Wednesdays. Up & Coming Weekly welcomes manuscripts, photographs and artwork for publication consideration, but assumes no responsibility for them. We cannot accept responsibility for the return of unsolicited manuscripts or material. Opinions expressed by contributors do not necessarily reflect the views of the publisher. The publisher reserves the right to edit or reject copy submitted for publication. 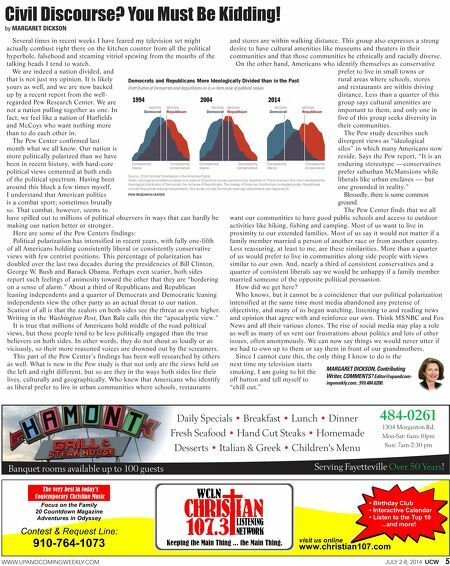 Up & Coming Weekly is free of charge and distributed at indoor and outdoor locations throughout Fayetteville, Fort Bragg, Pope Air Force Base, Hope Mills and Spring Lake. Readers are limited to one copy per per- son. Subscriptions can be purchased for $30 for six months or $60 for 12 months, delivered weekly by first class mail. ©2007 by F&B Publications, Inc. All rights reserved. Reproduction or use of editorial or advertisements without permission is strictly prohibited. High 89° Low 70° Thunderstorms 7 Forecast available 24 hours a day, 7 days a week. Monday July 7 Tuesday July 8 High 88° Low 71° Cloudy 24 / Thursday July 3 High 96° Low 70° Cloudy High 85° Low 71° Scattered Thunderstorms High 92º Low 71º PM Thunderstorms Friday July 4 Saturday July 5 Sunday July 6 Fayetteville's Weather Forecast Call 910.354.1679 BILL BOWMAN, Publisher, Up & Coming Weekly. COMMENTS? BILL@ upandcomingweekly.com. 910.484.6200.